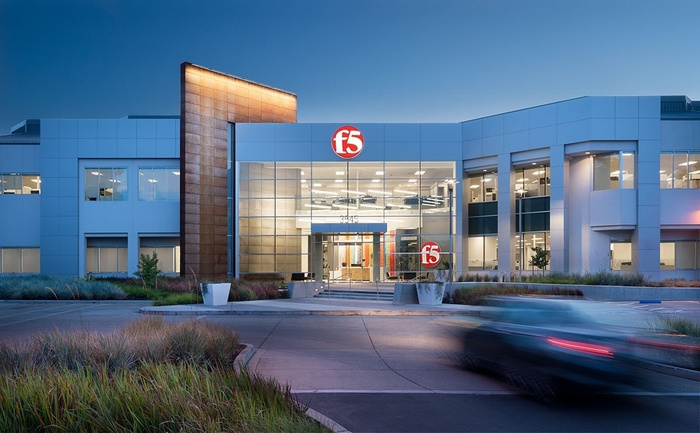 AAI has designed the new offices of F5 Networks, a tech company specializing in Application Delivery Network Technology, located in San Jose, California. When F5 Networks made the decision to relocate to accommodate growth and upgrade their image, they did not have to look any further than their own backyard. AAI led the design of a remarkable transformation, both inside and out, at 3545 N. First Street. F5 understood AAI’s vision for the building and secured the deal. While the reposition work was under construction, AAI collaborated with the Seattle based facilities team to design a layout and select materials that completed F5’s vision. That vision encompassing a global tech company, is communicated throughout the lobby, the International Technology Center, the open plan and collaboration areas and the break room. Natural materials such as wood, concrete and glass, define the interior enhanced by graphics throughout. The F5 International Technology Center (ITC) is a state-of-the-art facility that provides a real-world comprehensive environment to showcase, evaluate, and test F5 solutions and partner applications in the industry’s most comprehensive proof-of-concept lab. The ITC includes a world-class data center, a reception area at the main entry, 2 large conference rooms, a telepresence center, office area for ITC support personnel, a catering kitchen and restrooms. Softly curving glass walls and soffits provide a sense of flow and lend a spacious feel. Glass walls surround the data center and allow visitors to view the F5 product in action. Open ceilings, polished concrete flooring, and white finishes and cabinetry provide a clean, modern space in which to showcase the F5 products. The backlit F5 logo beckons visitors in red metal from the far end of the reception area.